Happy Tuesday! So the summer holidays are now here which for us means my eldest doesn’t have school nursery and all our local playgroups are closed so we’re going to be making the most of the warmer weather and getting out about visiting our local parks, having picnics and exploring. Last week we joined in with my co-hosts Cooking with Kids A – Z Blog Hop and shared our Super Easy Sausage Rolls recipe which always go down well and are the perfect picnic food. Thank you to everyone that linked up last week. My favourite post comes from Potty Adventures with their trip to Moel Famau Country Park. What a view but more importantly well done for carrying the little one to the top!! 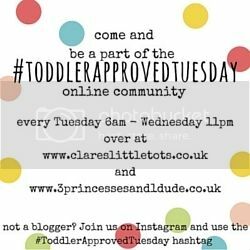 As it’s now the school summer holidays we’re keeping this link up open until Wednesday 6th September so don’t forget to keep popping back and sharing your summer toddler fun posts with us.